What do we mean by sharing? Sharing is easy on a Computer Network providing two people don’t want to make changes at the same time. 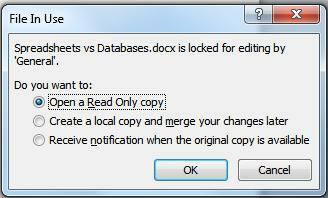 If you open a Word or Excel document while someone else has got it open, you will be asked if you want to open a Read Only Copy? Why? Because the first person to open the file can make changes. You can look but not touch. As soon as the first user has finished, you can begin to edit. But what happens if both of you want to make changes at the same time to the same document. In Word, you can’t. You have to wait until your colleague has finished. In Excel there is a primitive sharing mechanism that stores the content of changes in the workbook, so that provided one change doesn’t invalidate the other change, the file will be updated to reflect both. However, as more and more changes are made, the change history gets longer and longer and spreadsheets take longer to open and are more prone to corruption. The solution to the Spreadsheet Problem – you’ve probably guessed by now – a Database. Databases are designed to be shared and when configured correctly many people can make changes to the database at the same time with the exeption that two people cannot change the same piece of data at the same time. So if the database is designed to manage Contacts, several users can edit existing contacts or add new contacts at the same time. The key phrase here is ‘configured correctly’. Often Access Databases are not set up correctly for sharing and users find themselves ‘locked out’ . If this is a problem you are having, please let us know. It is a problem we can easily resolve.